Get a BlackBerry Torch for only $99 | BlackBerry Blast! Amazon is running one heck of a deal. 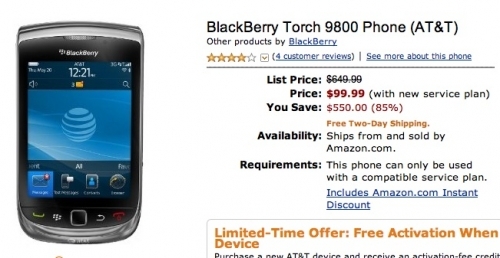 You can get the BlackBerry Torch 9800 for only $99 on contract if you buy it at Amazon. That's half the regular price of $199. Could it be that slow sales of the Torch are leading RIM to drop the price, or is Amazon just uber agressive? Amazon is also running a special on activation fees. For a limited time you can get the fee waived. Purchase a new AT&T device and receive an activation-fee credit for up to $36 for each qualifying line of service activated on an upgrade or a new two-year individual or family plan account purchased from Amazon.com or AmazonWireless between 12:00 midnight PDT on August 15, 2010, through 11:59 p.m. PDT, August 31, 2010. This offer is sponsored by AT&T and is valid in the United States and Puerto Rico. Activation-fee credit will appear on your bill and may take several billing cycles to appear. Standard early cancellation fee and other up-front and monthly charges and fees may apply."